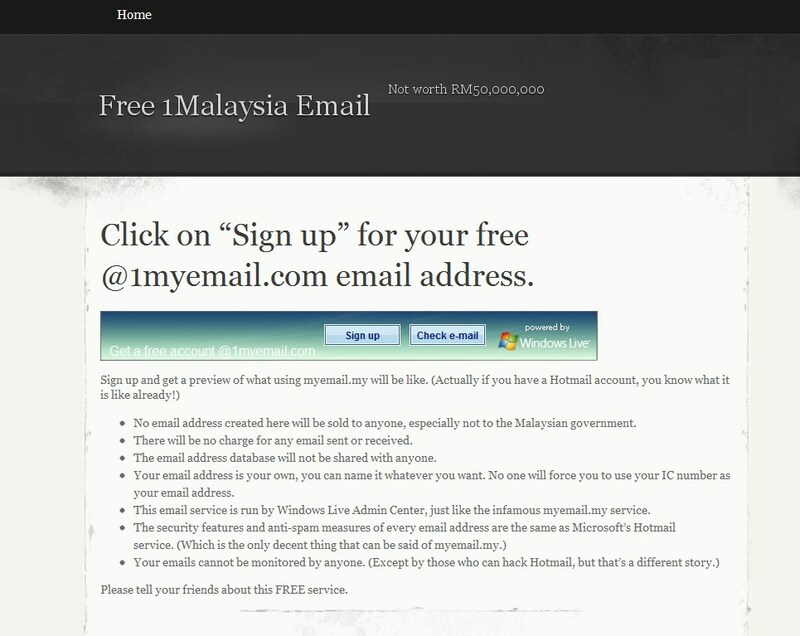 www.AnythingIWannaWrite.com: You Agree with 1Malaysia Email???? Recently, Najib launch the 1Malaysia Email, said to be available for all Malaysian, RM 50 Million project (he say not using Malaysian money wor, you believe a? ), and each email sent by government will be charge RM0.5 (how many % of this will be directed into his pocket?)? There are free email services all over the internet, why our stupid government want to choose the one with RM0.5 per email. I believe every rakyat that use internet, knows or even sign up for free email from the internet, hotmail, gmail, yahoo, linuxmail, (lots of them). I remember from the presentation in TV news, they said that the service including "digitizing" our bills, and send them to our email. Ok, I have one question, all our telephone bills, water bills, electric bills, before they are being print out and sent to our house, what is the form of the bills? Let me answer this, they are stored digitally in computer/server, they are generated using a computer. The bills is not written by hand. Please la, we are not fool. By sending the bills in digital form to emails, the cost of printing is actually being omitted, and they should not charge RM0.5 for each email. Talking about the security, will it be safer than Gmail, Hotmail & Yahoo? Confirm?? I am not sure about others, but for me, one thing very familiar in government agency, "server down". You go to pay summon in police station, they say "server down, come again tomorrow". You go post office, same excuse, and lots of these kind of thing especially in government agency including Malaysia internet provider, TMNET (please leave comment if you agree with this). 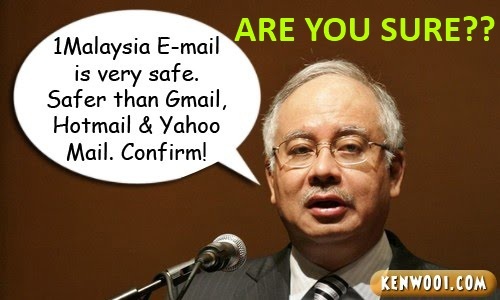 How are we going to believe this 1Malaysia E-mail to be safer (compare to Gmail? Are you kidding?). How if one day the 1Malaysia server down? I know they can always guarantee this, and if something wrong one day, they will say "server down". Somewhere in Malaysia (I guess), someone create this site called http://1myemail.com/. Now, this is one example that government should follow. Free 1Malaysia Email. Few nice points mentioned on the site, NO charges for any email sent or received, emails cannot be monitored by anyone (including government), you can name it whatever you want, etc. Please la Najib, try to do something that is really benefit the rakyat, and not your pocket. RM0.5 per email sent by government? F*** it..